12 WAYS TO GET YOUR (FITNESS) GROOVE BACK! Has it been weeks or months since you last worked out? Longer, perhaps? Fear not! We’ve put together 12 easy tips to help you get back to becoming your best self! “I’ll start my new program on Monday.” Sound familiar? We’ve all said it before! Don’t wait a day longer to get back on track. Start now and you’ll be glad you did! We recommend getting back to basics. There is nothing like putting pen to paper and physically writing down your 30-day, 60-day, and 90-day goals. Personal goal setting is an important part of any fitness regimen. In fact, it is just as important as keeping track of the calories you consume and the exercises you perform. When setting your personal goals, it’s important that you come up with fitness goals that are challenging but achievable. I would challenge you to take it a step beyond what most would do and record not only WHAT you want to achieve, but HOW you plan on achieving it with specific action steps. 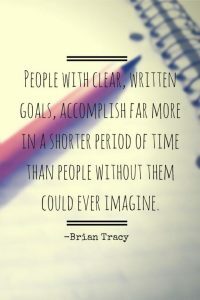 Check out our post on The Importance of Goal Setting for more tips, OR SCHEDULE A COMPLIMENTARY GOAL SESSION with one of our trainers! Share your goals with someone else. A little accountability goes a long way. Once you have stated your goals out loud, you are more likely to follow through. Sharing your goals with a friend – or better yet, having your friend join you in the gym – will increase your odds of success. You’ll be less likely to skip out on a workout if you know someone is there waiting for you. You can also talk and text with each other throughout the week to make sure you’re both staying on track. Can’t find a buddy? WE will be your buddy! Contact us today and schedule a complimentary planning session with a trainer! Think back to the last time you decided to get serious about your fitness, you were probably on a good roll. And then it happened…life got in the way, you became too busy, you lost some motivation. Maybe it was as simple as an extra-busy week, or perhaps it more complicated. Maybe you weren’t seeing the results you wanted and started to become frustrated and lose interest. Whatever the reason, it’s important to identify WHY you got off track. Knowing what led you astray will prepare you this time around should the same obstacles arise. If your life is busy (whose isn’t? ), it can be easy to push fitness to the side. 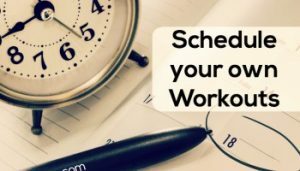 That’s why it’s important to schedule your workouts just as you would other important appointments. Treat them as “must-dos” and not “if I have time’s.” Google Calendar has a “Goals” feature that helps you pencil in important tasks. Simply click a category (like Exercise, Build a Skill, or Me Time), and add a specific activity. The calendar will automatically find open slots, fill them in with your goal, and send you reminders. For more on Google’s “Goals” tool, check out this article: HOW GOOGLE CAN HELP YOU CRUSH YOUR (FITNESS) GOALS. You’re trying to make a complete-180 with your life – all in one jump…STOP! STOP TRYING TO DO IT ALL AT ONCE! You’re excited about your new workout regimen. You bought new gym shoes, some amazing new workout gear, as well as an entire grocery store of “healthy foods.” You’re ready to do this! It’s great that you’re raring to get started, but try not to go ALL in at once with your fitness plan. Sometimes this can lead to overwhelm, and we don’t want you giving up prematurely. Instead, aim to take one important action per week. For example, make Week 1 the week that you start adding more healthy protein to your diet. Once you’ve mastered one new habit, you can add another. Before getting started, uncover your deep-rooted motivations for shaping up – your “WHY.” Ask yourself questions like: “What If I didn’t change my lifestyle right now? What would life look like for me? Would I be OK with not having enough energy to play with my kids, or being three sizes bigger than my ideal weight?” If you can’t close your eyes and see your “why” in detail, now is a good time to get clarity. We need to have a vision of the future that is so compelling we can see it as clearly as what is right in front of us. Similarly, ask yourself how you would benefit from getting in shape: “How happy would I be with a new, healthier body? How much more confident would I be in social situations?” Answering these questions will help you get to the heart of why you’re here and help you through the process. Need help finding your “why?” Contact us today to schedule a complimentary consultation! Maybe it was the monotony of your old routine that got to you before. If you’ve been exercising for years and have rarely switched things up, then you’re due for a change. This time around, why not try a new sport, exercise class, or workout routine? It’ll be like a brand-new relationship – exciting and mysterious! Ready to give personal training a try? Contact us today to get started! Life isn’t always predictable, so plan for the unexpected. There will be times when things like unexpected overtime or family commitments threaten your fitness goals. We all have bad days. Sometimes we all feel bad about ourselves even when we have NO reason to do so. I wish it never happened, but the way to lessen those tough moments is to create a better context of “health.” In these situations, stay prepared by always having healthy, high-protein snacks on you. You can also keep a few simple exercise gadgets at home (like an exercise mat and dumbbells) for when you’re too busy to make it to the gym. Want some more help creating a fall-back plan? Check out: Life Happens and That’s OK! and STRENGTH IN THE STRUGGLE – HOW TO STAY FIT WHEN THINGS DON’T GO AS PLANNED. Have a significant other or friend who isn’t as excited about fitness as you are? You’ll need to get them on board PRONTO! Find activities that they enjoys so that you can be active together, or suggest healthy meals with ingredients you know they love. Above all else, don’t let them sneak junk food into your grocery cart! When you’re both on the same page, you’ll be more likely to stick with your new plan. When you think of getting fit, resting is probably not the first thing that comes to mind. It is true that becoming healthy and fit involves work. It involves lots of effort and sweat and determination. But it also involves taking time to Rest and Revitalize. To reach your goals, you need balance: both hard work and R & R. Why is it so important to get seven or eight solid hours of sleep each night? Because when you start exercising again, your body will need that precious time to recover and recoup. Last but not least, don’t wait until the end of your journey to celebrate success. Reward yourself along the way, because every small milestone deserves recognition. You reached a goal, you’re making it happen, and you deserve a huge pat on the back! If you are looking for additional resources or help getting (back) on track, contact us today to schedule your FREE SUCCESS SESSION with a trainer! ← A TEAM OF FITNESS EXPERTS, DEDICATED TO YOUR SUCCESS.